This recipe is made in two stages - so don't be put off by the length of the recipe. Basically, you make the simple Saffron Rice Pilaf. While that's simmering you prepare the paella ingredients. Or you can cook the pilaf rice in advance. Whichever method you use, the secret is to get all the ingredients and equipment out first - then go for it! Replace oil with oil spray. Replace bought mayo with our reduced-fat quick tofu mayo instead of a bought version. For an even lower-fat alternative, use plain soya yoghurt, preferably Sojade brand, and mix with crushed garlic. The Saffron Pilaf Rice freezes well, as does the complete dish - the tofu may become a little bit more chewy. 2. In a medium-sized heavy saucepan, sauté the onion and garlic in oil over a medium heat until just softened. 3. Add the cumin, fennel seed, pepper and salt. 4. Sauté for 1 minute. 5. Add the rice and stir constantly for about 2 minutes or until the rice smells fragrant. 6. Add the saffron and water, bring rice to the boil and cover. 7. Reduce the heat to medium-low and simmer for about 20-25 minutes, or until the liquid is absorbed. 8. Remove from heat and let sit for 10 minutes. 9. Meanwhile, prepare all vegetables and other ingredients. 10. Soak the arame in cold water. 11. Sauté the onions, garlic and peppers in the olive oil in a large heavy pan, until the onions have softened – about 5 minutes. 12. Add the oregano, chilli flakes, orange zest and cumin seeds. 13. Stir and sauté for 1 minute. Drain and rinse the arame when it is ready, then set aside. 14. Add the tomatoes, smoked tofu, courgettes, arame, capers and black olives. 15. Put on greens to steam. 16. Reduce heat under paella to medium low and simmer for 5 minutes. 17. Add the mushrooms and sauté another minute or 2. 18. Stir in the pilaf, parsley and salt to taste. 20. Adjust seasoning if necessary. 22. Mix vegan mayo and garlic together to make aioli. 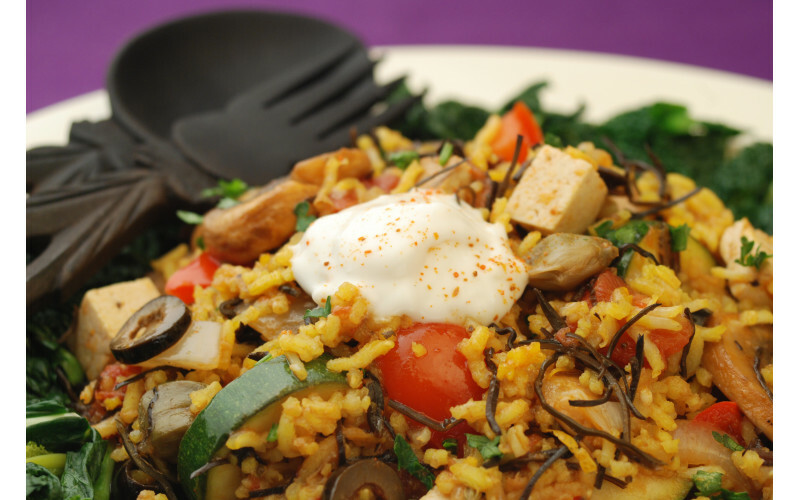 To serve: spoon paella in middle of large plate, arrange greens round edges and put a dab of aioli in the middle.